Our neighbor has given us a box of citrus fruit! Tangerines, oranges and lemons. Besides making fresh squeezed OJ for Matt in the morning I have been using it in marinades. I mixed the juice of a small grapefruit, orange and a bit of lemon with Braggs, pepper and olive oil. 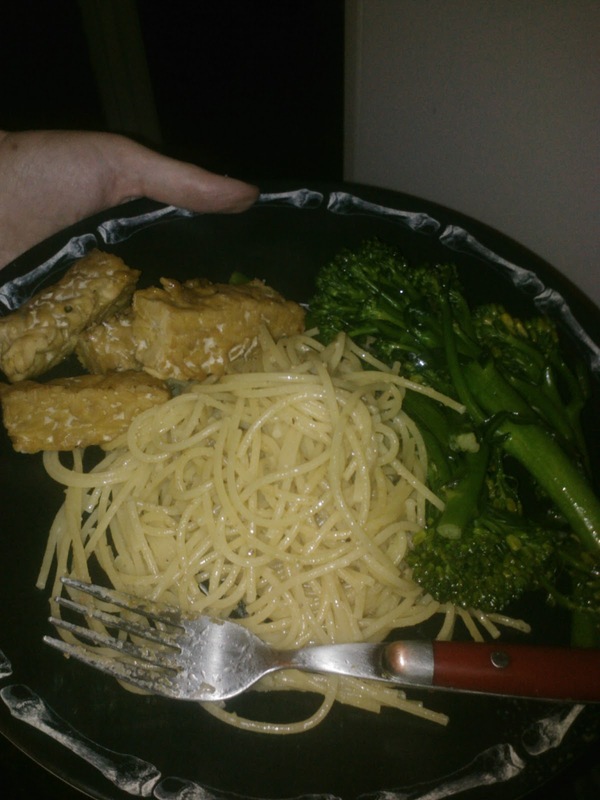 I marinated the tempeh for an hour and baked it covered in foil for 20 minutes, flipping once and then leaving it uncovered and baking for 10 minutes. I find covering the tempeh with foil lets it steam in the flavor. I used the rest of the lemon to make lemon brocolini from the Meatless cookbook. I served it with a side dish from my childhood spaghetti with Earth Balance and vegan Parmesan cheeze. Simple but flavorful with all of the fresh from the tree citrus.